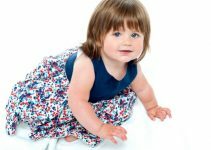 Baby Common Cough And Cold - Which are the Best Remedies? It is very common for babies to get a cold. Most of the cold and cough infections are transmitted by viruses. There are so many types of viruses that can cause the infection. The viral infections are common when the immunity of the body is low. Other factors like sudden change in the climate, exposure to draft of cold, temperature changes, touching contaminated objects are the commonest precursors to getting a cold. If you were to count how many times you have got a cold in your lifetime, you would not remember. 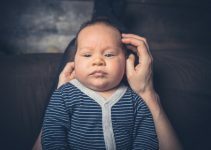 So for your baby to develop a strong immunity against viruses, he too will have to cross over these minor infections, including baby common cough and cold. The only important thing to differentiate here is that the cold is viral and the baby does not have an associated throat or ear infection that requires specific medications. In babies, colds are common because they tend to touch everything and also put things in their mouth. Contaminated surfaces can be easy sources of the infection. The immune system of babies is also immature making them prone to getting infections. 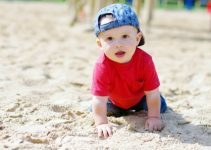 Cross infections like toddler cough cold are also very common in kids going to preschool where they catch the infection from another child who has the cold. 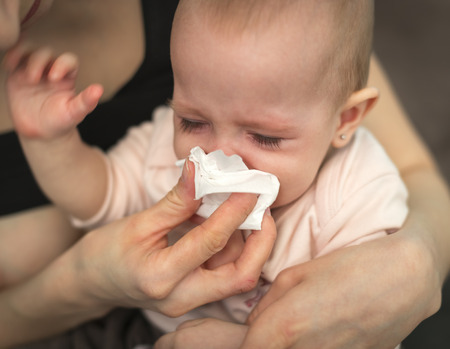 The infant cold symptoms may begin with a runny nose with clear watery discharge which can later on become thick and yellowish green as the cold ripens. Cough is also common and it may be dry cough or loose with rattling of phlegm in the chest. Infant dry cough needs to be differentiated from whooping cough where the baby keeps coughing. It is considered as a more serious problem. In more than half the colds, fever is an accompanying symptom. In babies fever can lead to anxiety in the parents. This is how you can differentiate if your child is playful and normal when the fever drops and gets cranky when the fever sets in, then it is most likely to be a cold. If the child is unwell and not normal even after the fever has come back to normal, then it is most likely to be something else. If the child has some other infection, the above symptoms may show up but in addition there will congestion of the chest on examination and at times diarrhea and vomiting. If the running nose is followed by a fever, then it is most likely a baby common cough and cold. Another form of cold and cough is allergic. If the baby is allergic to something example animal dander, pollens or dust then the presentation will be slightly different. The common infant flu symptoms are itchy and runny nose, watering from the eyes, sneezing and itching on the skin. Allergic colds are mostly never accompanied by fever. When an adult gets cold and cough, he normally takes the over the counter medicines that are commonly used. But the same cannot be done for infants and toddlers as children’s cough medicine is not the same as adults. For a baby you can try the below home remedies to help him recover from a cold. They are safe and will not harm your baby in any way. Hydration: During a cold, the best thing you can do is keep the hydration and fluid intake high. If the baby is less than 6 months then give more breast milk and formula. After the age of six months, you can add some boiled and cooled water and juices. Older kids and toddlers can be given warm liquids like chicken soup, hot chocolate or warm milk. Good water intake helps to maintain the body temperature especially if your baby has a fever. Saline Drops: Saline drops are best remedy for baby stuffy nose. In colds, the nasal mucous membrane gets swollen and so the child has difficulty in breathing at night, eating and even swallowing. The salt present in saline drops helps to shrink the swollen membrane and also makes the mucous thin. This provides relief to the baby as he can breathe freely. In small babies, the runny mucous should be removed from the nose with the help of a suction bulb. Use saline drops three to four times a day and before going to bed at night. Position during sleep: When your baby has a cold, keep the head end of the bed slightly raised. This can be easily done by placing a folded blanket under the head. This will prevent the nose from getting blocked and help the baby to breathe easily. Apply a drop of eucalyptus oil on the pillow where the child will sleep. The smell will help to open up the blocked nose and help the child sleep better. Honey: Honey is one of the best natural cough remedies. It should be given to children only above the age of one. Below one year, the baby is at a risk of developing an infection called botulism. Honey and ginger juice mixed together is a very effective toddler cough medicine. It works better than other OTC medicines like cough syrup for kids. Use Humidifiers: Using a humidifier will help the air to become humid and so the baby will be able to breathe better. Cool mist humidifiers work better. Fevers: If your baby has a fever along with the cold, you can give acetaminophen after consulting your pediatrician. The dosage to be given is decided on the basis of the weight of the baby. So you should use the measuring spoon or dropper given with the medicine and give the exact dose that is advised. Giving more quantities can harm the baby’s liver. Give the baby adequate fluids during a fever as he will be losing a lot of body water in the form of sweat. If you feel that the fever is rising and the baby is uncomfortable, you can try cold sponging. Use a rectangular cloth piece and dip it in cold water and place it on the forehead of the baby. This is more useful when the fevers are very high but you can try it. Foods: When your little one is unwell, he will be eating less than normal. It is all right and there is nothing to stress about. When you are unwell, the same happens with you too. At this time you can offer the child foods that are easy to swallow as they may have a sore throat too. Soft foods like yogurt, puddings and applesauce can be tried. If the child is older then you can try giving warm liquids like chicken soup or warm milk. Milk with a pinch of turmeric is a well tested home remedy and is very effective to fight colds and throat infections. Medications: If the cold does not resolve in a few days and the baby is restless and very irritable, then the doctor may prescribe some decongestants or anti allergic medications depending on the age of the child. Cold medicine for babies should always be given after consulting the doctor and you should never give them the medicines that are used for adults.